In 1975, Don French, a buyer for the company Radio Shack (a successful American chain of electronics stores, owned by Tandy Corp.) in the West Coast, purchased a MITS Altair computer, which he used for inventory control. He became so fond of his new toy, that began designing his own kit and tried to convince the vice president of manufacturing John Roach, the company to develop and sell such a device. In November, 1976, TRS hired the 24 y.o. nerd Steve Leininger, then working for National Semiconductor (and a member of the Homebrew Computer Club, just like Apple's Steve Jobs and Steve Wozniak and Lee Felsenstein of Osborne-1, to design the machine. In December 1976 French and Leininger received official approval for their project and in February 1977 they showed their prototype, running a simple tax-accounting program, to Charles Tandy, the owner of Radio Shack's parent Tandy Corporation. A funny incident happened during the demonstration, as the big boss was asked to enter a salary and he entered 150000, but the variable for this figure was a 16-bit integer, thus the program crashed miserably. So Mr. Tandy was kindly asked to enter a number up to 32000 in order to get the program working :-) It was somewhat confusing the constructors to make such underestimation of their boss' salary (and to miss a validation check for the input), but nevertheless Tandy gave "OK" to the project, so TRS-80 ("TRS" stood for "Tandy Radio Shack" and the "80″referenced the microprocessor, the Z-80) was announced at a press conference in August, with first orders shipped in September, 1977. French and Leininger suggested that the company could sell 50000 computers, but more skeptical executives disagreed and suggested 1000 to 3000 per year. Roach persuaded Tandy to agree to build 3500 (the number of Radio Shack stores), so that each store could use a computer for inventory purposes if they did not sell. Suddenly (for the bosses), in several days over 15000 people called Radio Shack to purchase a TRS-80, paralyzing its switchboard. Still forecasting 3000 sales a year, the company sold over 10000 TRS-80 Model Is in its first one and a half months of sales, and over 200000 during the product's lifetime. The Model I went on to become the best-selling microcomputer for several years and 1979, it had the largest available selection of software in the microcomputer market. So, what made the TRS-80 such a market hit? 1. The price. 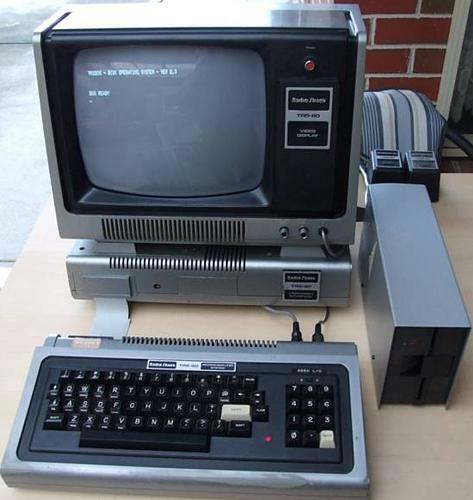 TRS-80 was announced at 399 USD, or 599 with a 12" monitor and a Radio Shack tape recorder as data cassette storage, while its direct rivals, like Commodore PET was announced at 795 USD, and Apple II was announced at 1298 USD. 2. The massive market invasion. Commodore PET was announced several months earlier but had not yet shipped. Moreover Radio Shack use its more than 3500 electronics stores to distribute the machine. 3. TRS-80 was a technically sound machine. It featured a Zilog Z80 processor clocked at 1.77 MHz, 4 KB of RAM, Cassette I/O and video ports, 12-inch monochrome monitor (64 X 16 text), operating system was	BASIC in ROM. The serious users eventually purchased the $299 Expansion Interface (see the attractive external module which sits under the monitor), which offered many improvements over the basic TRS-80 like: Printer port; Floppy disk controller (up to 4 drives); Expansion port; Optional serial port; Up to 32K additional RAM; Two tape drive connectors; Signals for a real time clock.